It has long been known that ancient sacred sites exhibit special character not only related to their standing stones but the particular way the stones are geometrically laid out. 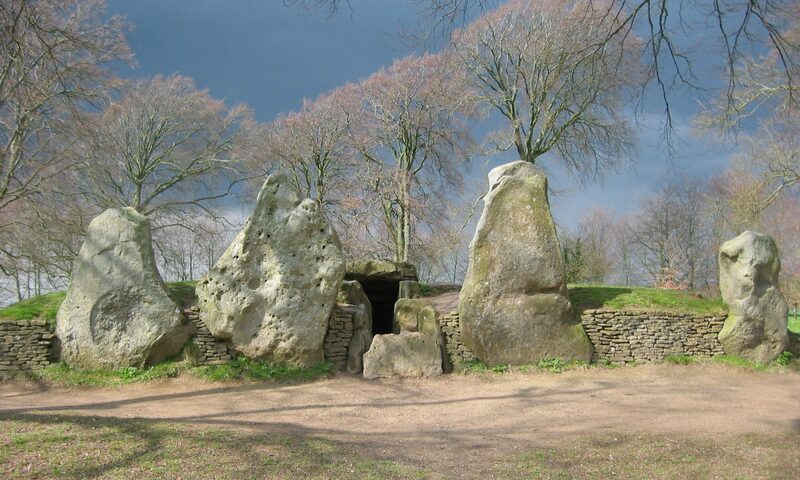 Well known sites such as Stonehenge and Avebury have in recent times been shown to be what are now known as astronomical laboratories capable of predicting cyclic solar and stellar phenomena with remarkable accuracy. The problem for us today is to comprehend how our Neolithic forefathers came to know, understand and use this knowledge in such a remarkable fashion. Study of these monuments as well as others such as the pyramids at Giza show clearly the fundamental mathematical laws encompassed within their construction. All of this knowledge is now referred to as Sacred Geometry. In essence, this comes down to a science of mathematics which was well codified and documented in ancient Greece. In particular, the world was seen to consist of an amalgam of five fundamental shapes known latterly as the Platonic solids. Together, they were deemed to form the world as we know it, endowing it with a source of power we now term earth energy grid, see Fig. 1. Although conventional science does not recognise this concept, its manifestation in terms of man’s ability to detect its presence, is very well explored – our ancestors having found that at crossover points of grid lines, special properties which affect our consciousness are manifested. This is the origin of all sacred sites, including mediaeval churches, built on earlier so called pagan sites. The energy grid lines and geometrical patterns within sacred sites are detectable by dowsing and what is surprising is that the shapes and associated numbers do indeed reflect those found in the Platonic solids. In particular, the two dominant fundamental shapes are those of the pentagon and hexagon. These can be discovered from the basic spider’s web pattern found at many henges and stone circles. Fig. 2 shows the basic shape. Three rings (or multiples thereof) constitute the basis of a hexagon pattern and five rings, a pentagon. The twelve radial lines are in fact related to another phenomenon well known to the Greeks and indeed earlier civilisations, namely the musical scale based on Pythagorean intervals. Each 30 degree sector constitutes a semitone interval on the western musical scale. This simply means that one revolution of the circle is in fact an octave. A stone circle or any earth acupuncture point is simply a source for a column of energy which rises from the earth, making its way skyward and taking on the shape of a spiral. This is known as a columnar vortex, the physics of which was well studied in the 19th century. The structure of this vortex is governed by the balance between the Earth’s atmospheric pressure and a very important feature of the Earth’s geophysics, namely its magnetic field. Since both these phenomena exhibit pressure ( the magnetic field is well known for generating a force) and the two are in balance under normal circumstances, it turns out that this is so only when there is an energy flux radiated from the earth at a modest velocity of around 10ft/sec. This is what is termed a subtle energy in the world of esoterics and is believed to be essentially the same as that physicists term zero point energy or the electromagnetic fluctuations of the vacuum field. This is the crucial area where the two philosophies of the world – the mystical and scientific – may well meet. It is in fact a return to the concept of a universal sea of energy which we know is essentially electrical in nature and and also affects the human mind. This energy can be envisaged as the flow of a fluid and in much the same way as a stone dropped in water creates a set of ripples around it, gradually becoming closer together the further away from the centre one moves, dowsing any object also creates a similar set of detectable rings. It turns out that the final shape looks in fact like a nested set of toroids. Fig. 3 shows how this looks as a composite shape. The geometry is such that, again an ubiquitous number 0.891, the ratio of a major tone appears, showing once more the link to the 12 note musical scale. The resulting disc shape is in fact virtually identical with that of a spiral galaxy! The toroidal geometry turns out to be even more universal when we consider the arrangement of the most fundamental Platonic solid, the dual tetrahedron. From this shape, all the others can be derived. Fig. 4 shows the fundamental shape which viewed as it sits relative to say a stone circle, projecting half its structure above the ground, the remainder below. A central sphere is surrounded by a toroid. It turns out that this is the basic YANG shape whereas, if the central sphere is absent, then the shape is that of the YIN symbol. These two mathematical forms clearly reveal at the most basic level their gender connotations. The energy flows around the toroids as waves and now it becomes clear why our Neolithic forefathers dug large ditches at henges such as Avebury. This allows the energy to flow freely in the ditch and dowsing can reveal its direction as well as the angle of the helical flow. This circumferential flow is entirely analogous with the flow of current in coils and its direction relative to the grid flow is simply given by Fleming’s Right Hand Rule for electric motor rotation. The same basic tetrahedral model encompassing toroids can be used to explain the luminosity phenomenon we observe at stone circles and indeed even at crop circles. They are in fact spherical vortices which absorb energy from their surrounds by a process which is called rectified diffusion as is that which is found in the phenomenon of cavitation- the sudden collapse of air bubbles in water. Thus the phenomenon of earth energies is beginning to look as though it is describable in geometrical terms which not only offers a good explanation for the shapes of stone and crop circles but also for the very thought processes associated with consciousness. Dowsing offers that special link between the conscious and sub-conscious mind. This fifth-and-a-half-sense potentially offers a way forward to help us understand not only the qualitative links between mind and the universe but also its quantitative nature.